Q: What is Cub Scouting? A: Cub Scouting is about learning by doing, serving others, respecting nature, working together, and developing character and leadership skills. The Cub Scout motto is "do your best". These young scouts will learn fun and practical skills, like tying knots, setting up a tent, shooting a bow and arrow, cooking a meal on a campfire, sending a secret code to a buddy, building a birdhouse, hiking.... They'll visit places like police stations, museums, nature centers, historical sites.... Cub Scouting provides adventure, helps them develop their skills and interests, teaches them to reach out to their community as they become useful and participating citizens, and is a lot of fun! Q: What is the structure of the organization? A: Scouts are separated into "dens" of (typically) 3-8 boys according to age/grade. The entire unit, consisting of all the dens, is referred to as the "pack". Our pack belongs to the Bill Hart District, and our district falls under the Western Los Angeles County Council (WLACC) of Boy Scouts of America. Q: What are the different ranks and what do they mean? 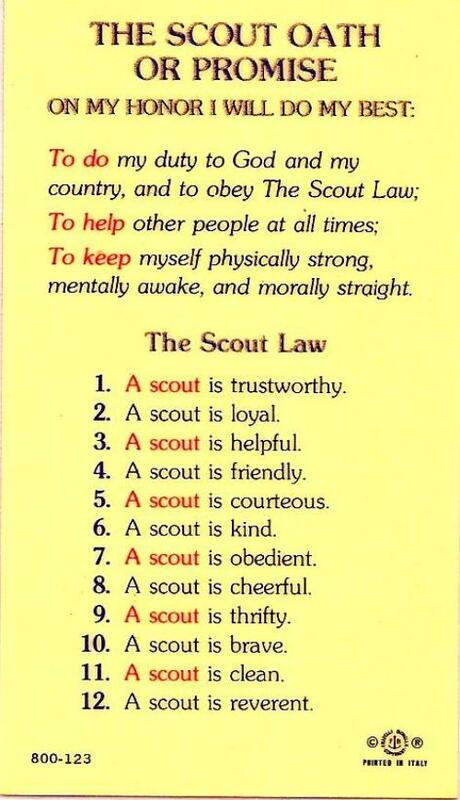 A: Scouts earn the ranks listed below as they progress through each year, but cannot go back to earn previous ranks (with the exception of the Bobcat rank), i.e. a 2nd grader would join as a Wolf but would not be able to retroactively earn the Lion and Tiger ranks. Q: How does advancement work? A: Each rank has a handbook filled with "adventures" - some are required for the rank and some are "elective adventures" for fun. We cover the requirements of all the required adventures at meetings (with occasional "homework" and outings) and as many of the elective adventures as we can fit in the year! As a boy completes an adventure, he earns a belt loop to wear on his uniform belt. When he completes the required rank adventures, he earns the patch for that rank. There are other optional awards that can be earned which are not found in the handbooks - see Awards for more information. Q: What if my son misses a meeting or outing? A: Almost all missed requirements can be made up at home - we just ask that you "do your best"! Den leaders can let you know what you missed and/or help you find an alternative activity for a missed outing. Q: What if my son wants to do adventures that you are not covering at meetings? A: We welcome and encourage him to do so! Den leaders can let you know if an adventure is not likely to be included in a future meeting and you may have your son complete the requirements in the book for that adventure at home. He will need to show his den leader what he has worked on and/or present to the den if that is part of the requirements. Q: What happens after 5th grade? A: Boys will "bridge" to a Boy Scout troop of their choosing after earning their Arrow Of Light. We are partnered with Troop 58, which also meets on Mondays at St. Clare. Boys who are already 11 years old can not join a Cub Scout pack, but they can join a Boy Scout troop without having been in Cub Scouts. Q: Can my son in TK join as a Lion? A: Lions must be in kindergarten. Younger siblings are welcome to attend pack events with their families! Q: Can my daughter join cub scouts? A: Pack 58 is a boy-only pack, but we can direct you to some of the girl-only or co-ed packs in our area that are accepting girls. Female siblings are welcome to attend pack events with their families! Q: What if my son has physical or mental disabilities? A: Scouting is accessible to children of all abilities! Please contact us so that we may discuss how we can best accommodate your child! Q: How much does scouting cost? A: Dues are $100 per school year. This covers all awards/patches/belt loops earned throughout the year, kits for derbies, and most events. There may be small costs for other family members at campouts and events where food is served. Uniforms cost about $50-75. (Side note: you can sometimes find cub scout uniform pieces at local thrift stores.) You may also need some camping equipment. If cost is a hardship, please let us know! Our pack also participates in some fundraising throughout the year, such as popcorn sales, to offset costs. Q: How much time is required? A: Scouts will have 3-4 meetings in a typical month - usually two 1-hour den meetings and one 2-3 hour pack meeting or event. Q: Do you meet during the summer? A: For members who are available, the pack will have at least one event during each summer month. Individual dens may choose to meet to work on elective adventures as desired. Q: What are some of the events held throughout the year? A: In a typical year there will be ceremonial advancement events, campouts, hikes, parties, day trips to interesting places, and district-level events. Please see our Event Calendar for more details! Q: I have never been camping - what will I need to bring? A: Please see our separate page on Camping. A: Parents can be den leaders, assistant den leaders, committee members or simply volunteer at specific events to help set up or clean up, transport equipment etc. Parents can arrange a tour of their place of work or help scouts learn about a hobby of theirs. There are many ways to be involved. If you are not sure how you can help, please talk to us, and/or check our Leadership page for positions that may need to be filled! Q: How do you communicate with parents? A: Pack 58 uses Scoutbook to send out event announcements and den meeting reminders via email, and to track individual scout advancement. Upon joining, you will receive an email invitation to join Scoutbook, where you may view your son's advancement and see detailed event information. Den leaders may also email den communication via Scoutbook, and may additionally choose to set up group texts for parents who would like receive communications on their mobile phones. We also have a private Facebook group (membership must be approved by our admin) where we can share pictures and event updates. Q: What kind of background checks are required for den leaders? A: Boy Scouts of America requires Criminal Background Checks for all adult leaders. All our leaders have required training addressing the protection of youth. Additionally, all units use "two-deep leadership", meaning that all scouting activities are supervised by at least two registered adult leaders and there is no one-on-one contact unless it is with the knowledge of the parent and in view of other adults and youth. Q: May I leave my son at meetings? A: Lions & Tigers are required to have an adult partner present at all times, but Wolves and older may be dropped off and picked up at the parent's discretion. All boys must be accompanied by an adult at pack events - and families are welcome at all pack events. Q: What is your relationship with St. Clare Catholic Church? A: St. Clare is our charter organization and gives us a place to hold most of our meetings and events. Like all packs, we do have a service obligation to our charter organization. We assist the Knights of Columbus at St. Clare in their annual Tootsie Roll Drive to raise money for Carousel Ranch, which serves children and adults with special needs. We may occasionally attend events that serve our Catholic members, but you are not required to participate in them. Membership in Pack 58 is open to boys of all faith backgrounds! A: We will provide you with a Youth Application to fill out (or you can fill one out online). We strongly encourage all adult partners to fill out an Adult Application as well (adults do not pay dues) and take the online Youth Protection Training. New den leaders will additionally need to take the Den Leader training (also available online) and VIRTUS training (another youth protection training required by our charter organization). Your scout will need a Class A uniform, a Class B shirt, and the handbook appropriate to his rank (optional). Q: What are the Class A and Class B uniforms? A: Please see our separate page on Uniforms. A: Sí, nuestro "cubmaster" habla español! Q: What does "Webelos" mean? A: "We'll Be Loyal Scouts!" A: You will occasionally see or hear mention of "Akela" in some scouting ceremonies or in scouting handbooks. This is a reference from Rudyard Kipling's The Jungle Book, where Akela is the leader of the wolf pack, and it is sometimes used to refer to adult leaders.